It was a typical evening in my house: my two young boys announced they were starving, it was an emergency, and they absolutely couldn't wait any longer to eat dinner, so I had to come up with something quick and easy. The best way to deal, I've found, is to see what you happen to have on hand, then wing it and try to create a meal you might want to repeat! Finding myself in such a spot recently, I pulled out tortillas, leftover pasta sauce, a few cooked carrots, and grated cheese. That's about all I had! The resulting dinner was a hearty quesadilla that I served with a salad. Both boys devoured their quesadillas! (But I admit that I ate most of their salads!) Here's a slightly more sophisticated and thought-out quesadilla recipe I created from that evening. What leftovers are in your fridge? What might be tasty between melting cheese and tortillas? Whatever it is . . . go for it! Coat a small saucepan with olive oil, and over medium heat, cook the carrots until they begin to soften, about 4 minutes. Add the meat and cook until any moisture has evaporated, and it's cooked through. Mix in the tomato sauce, season to taste with salt and pepper, and set aside. Coat a larger saute pan with olive oil over medium heat. Place two tortillas on the oil and sprinkle each one with about a quarter of cheese. Then place about half of the meat mixture on each tortilla, followed by the remaining cheese. 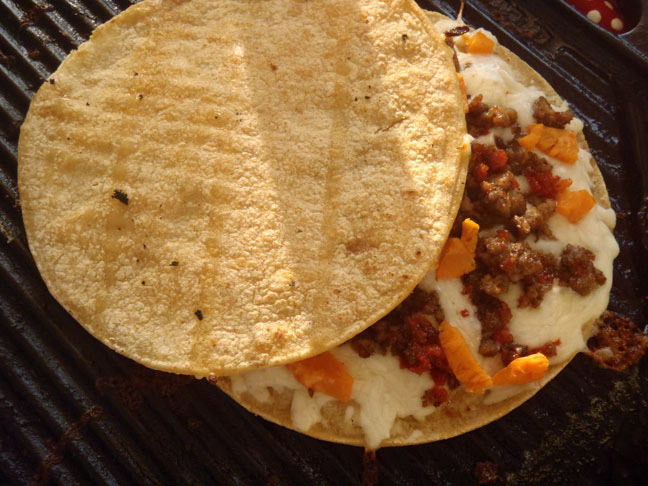 Use the other two tortillas as "roofs" to close up the quesadillas. Gently press to seal them, and using a metal spatula, flip them to briefly saute the other side. Remove from the pan, and cut into fourths.